Synopsis: Eight-year old George is so terrified he can't sleep. His parents are unable to help, and the Doctor answers their plea. This was a good episode playing on and explaining the "scariest place in the universe. A children's bedroom." 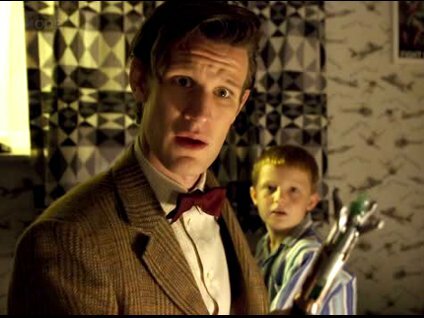 The Doctor (Matt Smith) gets a call from a little boy George who's parents are beside themselves over the fact that he's afraid of everything. A very funny scene has them go door-to-door in an apartment complex ("flat" as the British call it) trying to find the little boy. 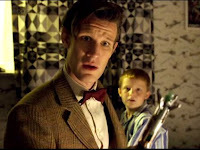 While the Doctor does find him and pretends to be some sort of child psychologist Amy and Rory are sucked into another world made of fake wooden props. The Doctor talks to the father, Alex (Daniel Mays), and assumes it's just another scared boy until he scans the cupboard and finds out its "off the scale." Whatever that means. Funny little bit where the Doctor and George's father debate opening the cupboard before the Doctor charges in. Turns out the boy's fears aren't the problem. Turns out the boy is the problem. He's an alien hidden by, you guessed it, "a perception filter." Amy and Rory are trapped in the doll house in the cupboard with living wooden dolls. Kinda scary. This also means they do virtually nothing in this episode besides running around. In the end, the heart of the story is the love of a child. The father has to accept that his son is not what he thinks he is, but like all children is looking for love. Not a lot of special effects in this episode, but it did what it set out to do. It told a story about average people looking for love. What did you think of this episode of Doctor Who? What were you afraid of when you were a child? I liked it, but didn't love it. There was an awful lot of nothing but running around and "Oh nooeezzz! The dolls! Don't let them touch me!" kinda stuff, wasn't it? There were little bits I thought were funny, like the worried concern on the Doctor's face when he saw the readings were off the scale, Amy's asking "Was I a..." (and Rory's quick "Yeah.") after they were out of the dollhouse....things like that were funny to me. It wasn't a terribly weak episode, but not the strongest either. I didn't have as many fears as a child as I do now (as a child, we're invincible!) , but I always had a heights thing, so I'll go with that. Spiders, snakes, boogeymen...they didn't frighten me so much. The episode was beautifully directed, but the story itself fell quite flat (and gets worse the more I think about it). Ponds this season, and would love your thoughts on the matter. April, I thought the dolls were going to be a lot scarier. Little funny bits. That could have been the whole review!